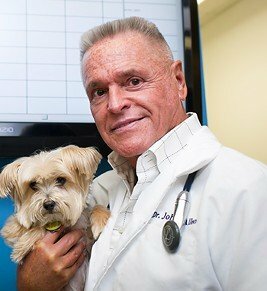 Dr. John on why your dog needs to be tested for Heartworm and be on prevention this summer! Every spring, in Etobicoke, we are busy testing dogs for Heartworm exposure and prescribing a monthly preventative, such as Revolution, to keep your dog protected from May to the end of October. Heartworm disease is a serious and potential fatal condition caused by worms that live in the heart and the pulmonary arteries of an infected dog. Dogs aquire this infection through mosquito bites and mosquitoes readily pick up the larval heartworms from infected dogs or coyotes and carry them to new dogs. We have TWO NEW CONCERNS THIS YEAR. We are all aware that coyotes are becoming more urban. Obviously coyotes are not tested for Heartworm Disease (HWD) OR on prevention so an infected coyote is a continual source of infection to our pet dogs. We have also experienced a very mild March where mosquitoes became active much earlier than usual. Similarly mosquitoes were around a lot later than October 31 last fall. Last year Royal York Animal Hospital diagnosed and treated NINE positive heartworm dogs and we expect those numbers to be higher in 2012. This spring, we were recommending earlier testing and starting protection immediately instead of waiting until June 1 to apply the first dose. Treatment for heartworm disease is available but is costly and can be dangerous. The use of preventative medication can eliminate the need for more expensive and uncomfortable treatments. Please call TODAY if your dog has not had a Heartworm Test yet this spring. 416-231-9293.